"St. Rita School represents the best education; the administration is devoted and compassionate, the faculty tirelessly dedicated to the student, and the family community committed to Christian ideals and values." 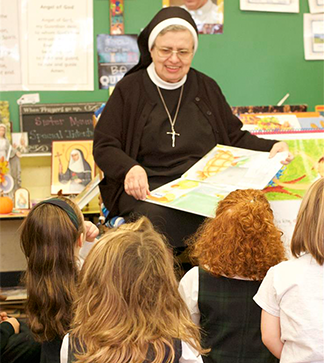 St. Rita School is committed to providing a Catholic education in an atmosphere of academic excellence. Above all, we focus on providing a loving environment where students can develop in mind, body, and soul. St. Rita School inspires students in pre-kindergarten through grade eight to achieve academic excellence in a safe, nurturing, and faith-filled Catholic environment. We prepare students to be morally responsible, innovative thinkers who, in today’s technology-guided global community, live and share the love of Christ. St. Rita School is a community of children, parents, teachers, and religious groups of the Church. The primary goal of the school is to nurture Catholic Christian moral principles by providing a warm, caring, and positive atmosphere. Furthermore, our goal is to teach the young to grow spiritually, intellectually, socially, and physically and to see that each child's gifts and talents are recognized and encouraged. St. Rita graduates are Christ-centered, lifelong learners. They ask, “Why?” and “How?” and “What if?” They show respect for authority, achieve with humility, and take responsibility for their actions. They know the value of community, the necessity of service, and the importance of living with integrity. They are prepared to adapt to a constantly changing world, but they are aware of the constants that never change: trust in God, concern for others, and doing what’s right because it’s the right thing to do.